Aaron Rodgers is doing all he can to get ready to face the Vikings on Sunday at Lambeau Field, the Packers quarterback told reporters. 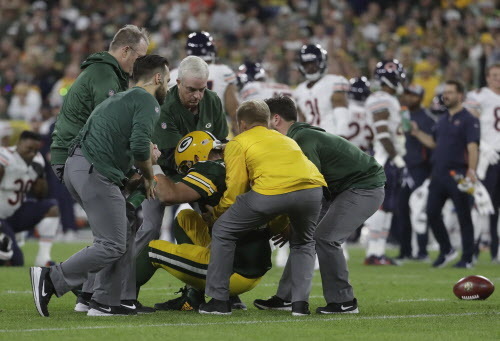 Rodgers, who was hurt Sunday night in a 24-23 comeback win against the Chicago Bears, said Wednesday he has a sprained knee. Coach Mike McCarthy indicated that Rodgers would rehab the knee this week in hopes of being ready to play. Rodgers said it could be a matter of pain management and that he may wear a brace on his injured knee. The last time the Vikings faced Rodgers, the quarterback was knocked out of the game with a broken collarbone suffered after Vikings linebacker Anthony Barr fell on top of a scrambling Rodgers.